Here at Kingpin, we specialise in manufacturing earth tags for the cable gland industry. We have worked closely with the industry for many years, so you can rely on us to produce the exact product you are looking for. Our knowledge of the cable gland sector is second to none. Earth tags provide an earth bond attachment for a cable gland, thus ensuring their safety. As anybody who has dealt with high levels of electricity will tell you, avoiding a shock of any level of of paramount importance. This makes earth tags perhaps the single most important component of the cable gland. Without it, or with a shoddy one installed, the fitter is putting everyone at risk. Kingpin earth tags are manufactured in various materials. are the industry standard, but we also supply , , and available upon request. These also can be manufactured in a range of sizes, although sizes vary between different base materials. We can manufacture in Banjo and semi tan gentle shape, in any material thickness up to 2mm thick. Our sizes go from M16 to M130 and ½ ” npt to 4″ npt. As we manufacture within the U.K, we can also offer Earth Tags with a bespoke hole size to fit our customer’s requirements. Our in-house manufacturing process means you won’t be dealing with middle men – you’ll be liaising directly with us, so you’ll receive exactly the product you require. Kingpin also pride ourselves on our quick turnaround times. We intend to provide you with the components you need in the quickest possible time, so we keep all of the common materials in stock at all times. This is on top of our industry leading prices – while we never compromise on quality, we also intend to make our products as affordable as possible. For all of these reasons, we should always be your number one choice for you cable gland earth tag needs. We supply to a wide range of industries, producing tiny and massive earth tags to the exact same elite quality level. Our aluminium earth tags are a favourite of the sign industry, thanks to their light weight and yet durable composition. We even have the capacity to supply truly gigantic earth tags, locknuts and washers for the oil rig sector. These colossal components are made of stainless steel, as so not to rust when exposed to sea water. Call 0121 559 7742 or contact us for earth tags enquiries and more information. Another vital safety element, locknuts help secure the cable gland safely in place, while also making it difficult to separate. To see our full range of locknuts, available in various materials and sizes, click above. 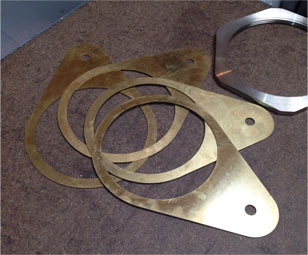 Our safety components also extend to washers, which guard against outside elements. Whatever material or size you are after, Kingpin can supply it.